Jolly Fish Press, 9781631632877, 368pp. Thirteen-year-old Lily Hartman always dreamed of adventure. A strong-willed girl, Lily felt trapped in a life of Victorian stuffiness at her prim boarding school. But after her father-a famous inventor-disappears on a routine zeppelin flight, Lily's life gets turned upside down. Now cared for by her guardian, the heartless Madame Verdigris, Lily is quite certain that she's being watched. Mysterious, silver-eyed men are lurking in the shadows, just waiting for their chance to strike. But what could they possibly want from her? There are rumors, Lily learns, that her father had invented the most valuable invention ever made-a perpetual motion machine. But if he made such a miraculous discovery, he certainly never told Lily. And all he left behind is a small box-with no key, no hinges. 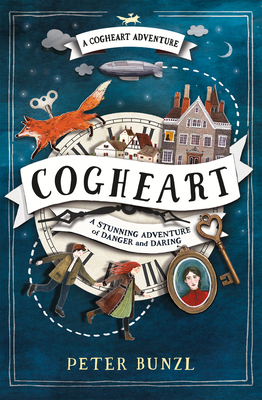 With the help of a clockmaker's son, Robert, and her mechanimal fox, Malkin, Lily escapes London in search of the one person who might know something about her father's disappearance-and what he left behind.